Sho Aoyama gained success as a Chinese-born Japanese chemical engineer. Yet, after years of multinational assignments he knew he needed a change. Thinking turned to action after witnessing the terror surrounding the 2016 Paris attacks. Sho was then inspired to found the WASHO Cooking Classes in his hometown of Osaka, Japan. He saw his opportunity to finally settle down and have the world come to him. Or rather, to his kitchen. Sho grew up in China with a father who was a chef for over 40 years. Starting in high school, his father taught him the basics of cooking. After locating in Japan he crystallized his knowledge by working his way through engineering school in a sushi restaurant. Sho quickly realized that the discipline he learned in college equally applies to a chef. Both must be well versed in the rules and practices of their trade and climb a hierarchical ladder of increasing responsibility for continued succeed. A full Japanese meal is one of different yet complementing textures and tastes. In the Japanese sushi world, before ever touching fish, a task considered near sacred, nearly five years are spent simply washing dishes. Though timelines may differ much the same occurs at a Parisian restaurant. The next step is washing and preparing sushi rice and eggs. If talented, expert knife skills are developed. It may take a decade before a chef in training is given fish. For additional insight, we recommend the documentary film Jiro Dreams of Sushi. Sho knew he cannot impart these years of practice in a single class. His school integrates much more. Cooking is traveling. It is history and culture. In sum, it is Sho’s curiosity served over steamed rice. 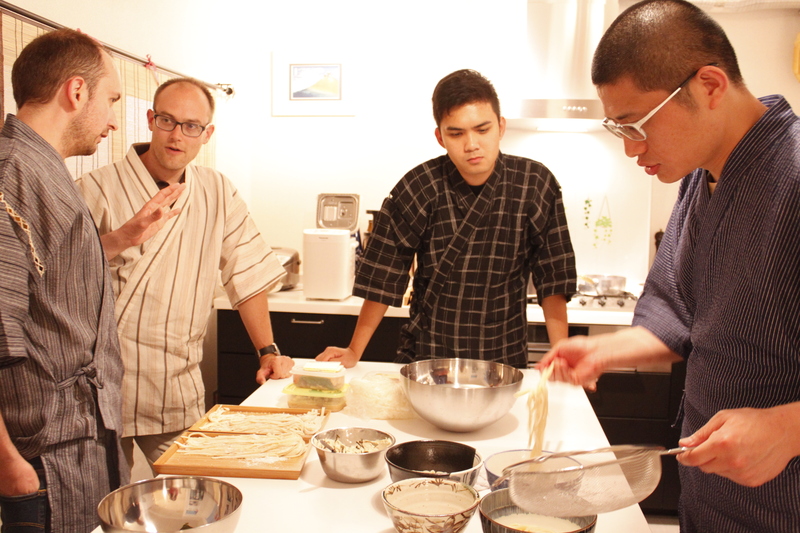 Cooking classes like those offered by Sho are an enriching element of any overseas trip. Food provides a gateway to many facets to a destination that are not captured on museum tours or landmark visits. Sushi which has become so emblematic of Japanese cuisine still holds secrets that can only be handed down by chefs like Sho. For example, in the summer more salt is added to balance out the salt lost through sweat. Similarly, women’s sushi rolls are generally more compact to better accommodate what may be a smaller mouth. Sho in action during one of his classes. Like all cultures Sho teaches how Japan’s history and geography play a vital role in its food values and food choices. The commonly practiced Shinto and Buddhist traditions emphasize austerity in all walks of life. Small morsels are encouraged. Japan’s geography equally determined the Japanese diet. Being a long chain of islands clearly led to its dependence on the seas for sustainability. Their mountainous terrain and lack of arable land limits widespread consumption of meats from domestic grazing animals. 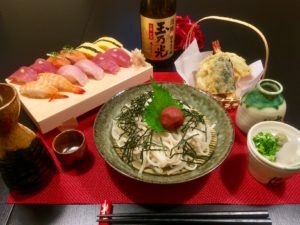 As a well-traveled and health conscious man, Sho readily compares and contrasts different cuisines for their health benefits. 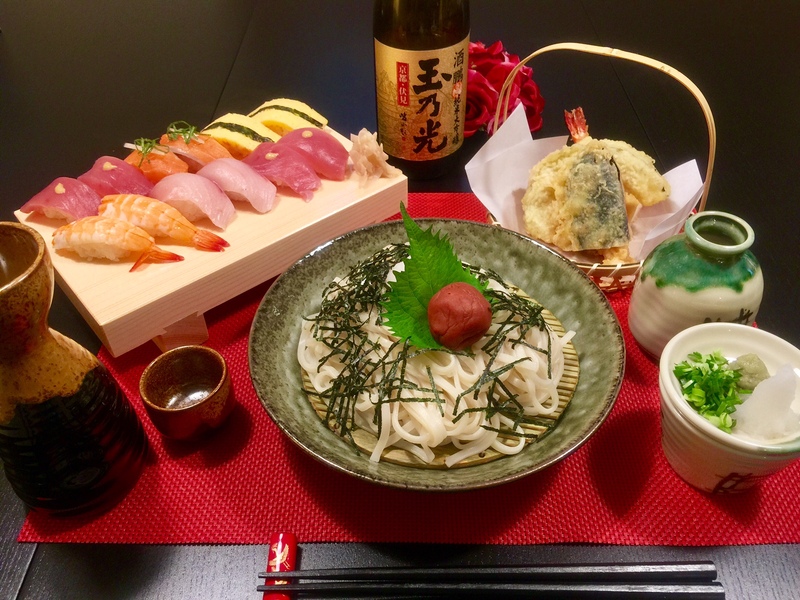 Sho emphasizes that traditional Japanese cuisine with its large consumption of fish and seaweed, minimal use of oils and meats, as well as a tradition of small servings fundamentally serves the Japanese and clearly aids in their longevity. . These topics are all covered in Sho’s classes. 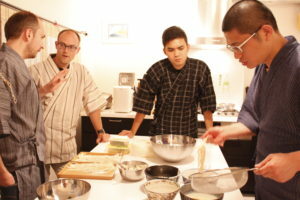 By discussing food and its many complexities, Sho’s students end class with the thought that cooking is a journey. It can takes you places – physically and emotionally – only to welcome you back home.